Paul Gannon joined Findlay Park in January 2019 as an equity analyst. 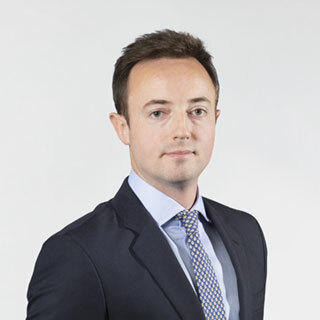 Prior to joining Findlay Park, Paul was a US equities analyst at Artemis, having begun his investment career at Threadneedle. To contact us, please either email our Investor Services team (info@findlaypark.com) or call them on +44 20 7968 4900. The website content is for information only and expresses no views as to the suitability of investments to the individual circumstances of the recipient. No information, comment or stated opinion within this website constitutes an offer to sell investments in any jurisdiction and may not be used to make such an offer. Therefore, no person in any jurisdiction may treat the website content as constituting an offer or invitation to buy investments. If, however, an offer to sell investments is made in the future it will be subject to information circulated by us at the time set out in the formal prospectus or equivalent document and not on the basis of the information contained in this website. It is the responsibility of every visitor to this website to satisfy themselves as to the full observance of the laws of any relevant country, including obtaining any government or other consent which may be required or observing any other formality which needs to be observed in that country. The Prospectus of Findlay Park Funds p.l.c. (the “Fund”) prohibits the selling of any shares in the Fund to US Persons (as defined in the Prospectus). Shares of the Fund and related documents may only be distributed in or from Switzerland to qualified investors within the meaning of Art. 10 Para. 3, 3bis and 3ter CISA. In Switzerland, the Representative is ACOLIN Fund Services AG, Affolternstrasse 56, CH-8050 Zürich, whilst the paying agent is Neue Helvetische Bank AG, Seefeldstrasse 215, CH-8008 Zurich. In respect of the units distributed in or from Switzerland, the place of performance and jurisdiction is at the registered office of the Representative in Switzerland. The basic documents of the Fund as well as the annual and semi-annual reports may be obtained in Switzerland free of charge at the office of the Representative. The investments and investment services to which this website relates are only intended for Investment Professionals. The website content is not directed to anyone who does not have professional experience in investing in equities. Any person who does not have professional experience investing in equities must not rely upon information available on this website as the basis of an investment decision and should seek professional advice. The value of investments may go down as well as up and are likely to be affected by fluctuations in exchange rates, therefore returns are not guaranteed. As result of this and with the effect of transaction charges, investors may not get back the amount they invested. We may update and change our site from time to time to reflect changes to our products, our users’ needs and our business priorities or our regulatory obligations. We will try to give you reasonable notice of any major changes. If you know or suspect that anyone other than you knows your user identification code or password, you must promptly notify us at info@findlaypark.com. If you wish to complain about information and materials uploaded by other users please contact us on info@findlaypark.com. If you wish to link to or make any use of content on our site other than that set out above, please contact info@findlaypark.com. AT FINDLAY PARK PARTNERS LLP WE ARE COMMITTED TO PROTECTING YOUR PRIVACY AND ENSURING YOUR PERSONAL DATA IS COLLECTED AND USED APPROPRIATELY, LAWFULLY AND TRANSPARENTLY. THIS PRIVACY NOTICE WILL INFORM YOU AS TO HOW WE LOOK AFTER YOUR PERSONAL DATA AND TELL YOU ABOUT YOUR PRIVACY RIGHTS AND HOW THE LAW PROTECTS YOU. Please see the Glossary to understand the meaning of some of the terms used in this privacy notice. This privacy notice aims to give you information on how Findlay Park Partners LLP collects and processes your personal data, including any data you may provide through our website. Findlay Park Partners LLP is the controller and responsible for your personal data (“Findlay Park”, “we”, “us” or “our” in this privacy notice). If you wish to raise a complaint about how we have handled your personal data, you have the right to contact the Information Commissioner’s Office (ICO), the UK supervisory authority for data protection issues (https://ico.org.uk/global/contact-us/ or 0303 123 1113). We would, however, appreciate the chance to deal with your concerns before you approach the ICO so please contact us in the first instance. We reserve the right, at our discretion, to change, modify, add to, or remove portions from this privacy notice. We will notify you of any material changes where we are required to do so. Any such notifications may be made by way of our website. Identity Data includes first name, maiden name, last name, username or similar identifier, marital status, title and, if applicable, details of your company’s shareholders, officers and authorised signatories. Profile Data includes your username and password, preferences, feedback and survey responses. Marketing and Communications Data includes your preferences in receiving marketing from us, your communication preferences, and data received from telephone conversations, emails and instant messaging. We make use of CCTV at our offices and may retain recordings. Where we need to collect personal data by law, or under the terms of a contract we have with you or any third party and you fail to provide that data when requested, we may not be able to perform the contract we have or are trying to enter into with you (for example, to provide you with goods or services). In this case, we may have to cancel a product or service you have with us but we will notify you if this is the case at the time. (c) from service providers or agents appointed by Findlay Park Funds plc. Identity and Contact Data from publicly availably sources such as Financial Conduct Authority’s financial services register, LinkedIn, company websites, Companies House and the Electoral Register based inside the EU. Please note that we may record telephone (both mobile and landline) conversations and keep copies of electronic communications. We may retain copies of these recordings and electronic communications for a period of at least five years (or longer if required for legal and regulatory purposes). Where we need to perform the contract we are about to enter into or have entered into with you or in relation to the provision of products or services to you. Monitoring or recording telephone calls with you to resolve any queries or issues. Where we need to comply with a legal or regulatory obligations, for example, confirming your identity for regulatory purposes or detecting and preventing fraud, money laundering, terrorist financing or bribery. To register you as a new client or contact (a) Identity (b) Contact Performance of a contract with you or the provision of services to you. Where you opt out of receiving these marketing messages, this will not apply to personal data provided to us as a result of product/service experience or other transactions. We require all third parties to respect the security of your personal data and to treat it in accordance with the law. We only allow our third-party service providers to process your personal data for specified purposes and in accordance with our instructions. We have put in place appropriate technical and organisational security measures to prevent your personal data from being accidentally lost, used or accessed in an unauthorised way, altered or disclosed. In addition, we limit access to your personal data to those employees, agents, contractors and other third parties who have a business need to know. They will only process your personal data on our instructions and they are subject to a duty of confidentiality. Findlay Park Investment Management Limited who is based in the United Kingdom and provides IT and system administration services. Professional advisers and service providers acting as processors or joint controllers including lawyers, bankers, brokers, auditors and insurers based inside or outside the EEA who provide consultancy, banking, trading, legal, insurance, IT, system administration services and accounting services. Agencies and organisations working to prevent fraud in financial services. Cookies are small text files that are placed on your computer by websites that you visit. They are widely used in order to make websites work, or work more efficiently, as well as to provide management information to the owners of the site. FPP is governed under the laws of England and Wales. The contents of www.findlaypark.com is owned and operated by FPP.